Former president Mahinda Rajapaksa greets supporters after landslide victory in the Local Government Election, February 12, 2018. NurPhoto/Press Association. All rights reserved. Sri Lanka celebrates its seventieth year of independence in 2018 in a country where ethnicity has been a deadly factor, and local elections can turn violent. This year’s election, held on 10 February, however, has been one of the most peaceful the country has known. The turnout was over 75%, which shows that people are keen on exercising their right to vote. Wickremesinghe added that introducing the new election system would give the current administration an advantage in the upcoming general election. Sri Lanka suffered from a protracted civil war between 1983 and 2009, so a peaceful election is certainly a welcome blessing to the fledgling democracy. However, there are signs that the results of the local election will not turn out to favor the ruling power in the end. Local elections in Sri Lanka might not have the same impact as the parliamentary or presidential elections, but the victory of former President Mahinda Rajapaksa means that he is back in politics full speed ahead and poised to regain political power. Rajapaksa lost the presidency in 2015 when the challenger Maithripala Sirisena won 51% of the votes. Reportedly, minorities like the Tamil and Muslim communities of Sri Lanka secured his victory. Sirisena, who now represents the Sri Lankan Freedom Party (SLFP), joined forces with Wickremesinghe (UNP). Together since 2015 they have politically dominated Sri Lanka. Even though Rajapaksa’s presidency was filled with allegations of corruption and nepotism, he has never lost his popularity among the Sinhala community. 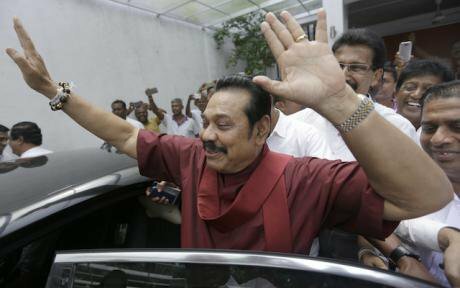 Rajapaksa is back under a new political banner after leaving his former party, the Sri Lankan Freedom Party (SLFP). Now, with the support of his brothers and former members of the SLFP, he leads Sri Lanka Podujana Peramuna. It seems that Rajapaksa has taken his revenge on both the UNP and SLFP by winning the recent election. After the election, he stated that the current government should dissolve parliament and call for re-elections. Given this background, there is no question that Rajapaksa has little intention of giving up his desire to become a prominent figure in the country’s political affairs once again. Knowing that there are potential clashes between supporters, Rajapaksa has urged his voters not to attack the losing side. He says: “No matter what they did to us we must set an example”. The local election clearly shows that the Tamil community in the North and East do not vote for the Sinhala major parties. The Tamil nationalist party, the Illankai Tamil Arasu Kachchi (ITAK), earned major victories in the councils in the north and to some extent in the east where the majority of the Tamil population resides. During the civil war, the Tamil guerilla movement Liberation Army of Tamil Eelam (LTTE) and its allies, operated in these areas. LTTE does not exist any more but its spirit lives on in the north. The Tamil community is reportedly under stress: reports of torture still keep coming in. Another big issue for the Tamil minority is land grabbing and resettlement. The Sinhala-dominated army is taking land from displaced Tamils and using it to expand their own estates. So old problems have persisted under the current presidency, with the result that the Tamil community does not place much trust in Sinhalese leadership in general. “An important issue is land : land distribution (…) is a very crucial factor which dominates our political tension as well. (…) in particular because livelihoods depend on land as far as every community is concerned”. Another thing that might worry Muslims in Sri Lanka after Rajapaksa’s success is that Sinhala-Buddhist nationalist movements might receive a boost. Under the last Rajapaksa rule, Mahinda’s brother, Gotabhaya Rajapaksa, was associated with the hardline Buddhist organization Bodu Bala Sena (BBS) – an organization that has an anti-Islamic agenda and sees Sri Lanka as a holy land for Buddhism. 2020, when the next presidential election will be held, is the year to look out for. Due to tenure regulations, Mahinda Rajapaksa will be unable to contest the current presidency. But in this year’s election Rajapaksa has showed that he is still popular. Perhaps one of his brothers will become a presidential candidate. The UNP might drop their support for President Sirisena and present their own candidate. So President Sirisena is likely to face problems no matter who he faces in 2020. While the major Sinhalese parties are competing for power, the two minorities will be struggling with their own concerns.